You should also mention that your sick time cannot be used to add to your service time unless you collect a pension (turn 55) within one year of leaving state service. Please read this sick leave blog post for more information. What happens if you leave but return after a few years?? I am vested and a tier 4. If I leave and return (before 7 years) will I stay the same tier? If you are vested with more than 10 years of service, then your membership will remain active until you retire. If you leave public service and come back, you’ll still be a Tier 4 member. If you are considering leaving public service, you will probably want to email our customer service representatives using our secure email form (see link below) for information specific to your account. Filling out the secure form allows us to safely contact you about your personal account information. There should be more clarification for anyone who vests out and then wants to collect a pension after turning 55; there are no benefits available once you start receiving your pension benefit. NOTHING, your Union will also turn their back on you, you do not receive a retirement ID card, no health, dental or vision benefits. 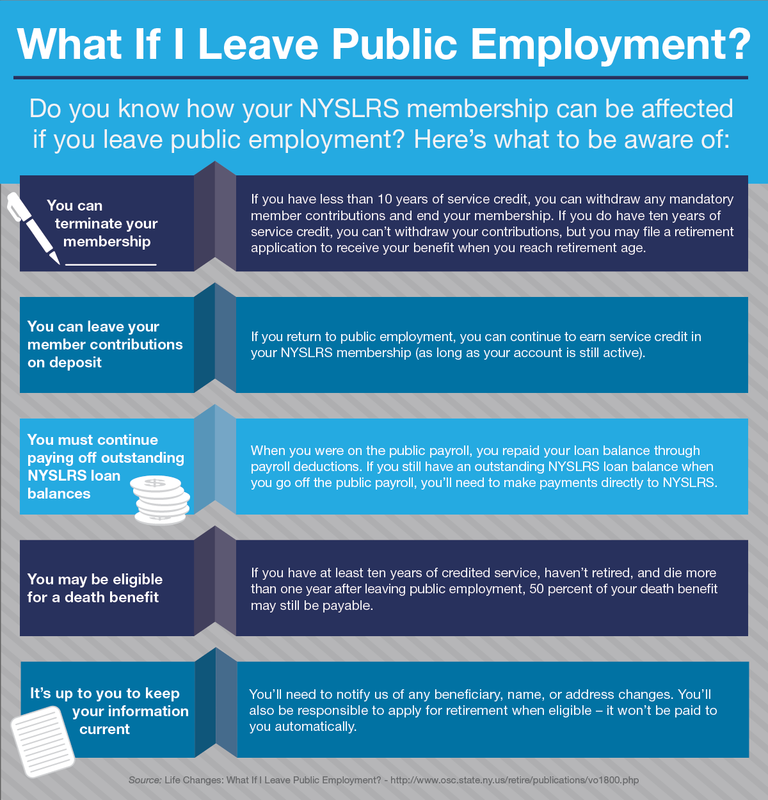 NYSLRS doesn’t administer health insurance programs for its members or retirees. Whether you work for New York State or another public employer, it’s a good idea to speak with your employer’s health benefits administrator (HBA) before leaving public employment. We do offer several publications that may help members decide whether to leave public service (Life Changes: What if I Leave Public Employment?) or plan for retirement (Straight Talk About Financial Planning For Your Retirement). More are available on our Publications page. The NYSLRS social media team doesn’t have access to your account information. We suggest you can contact our customer service representatives with your lump sum question. You can contact them using our secure email form. One of our representatives will review your account and respond to your questions. Filling out the secure form allows us to safely contact you about your personal account information.